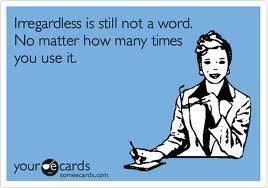 Regardless of what you have heard, "irregardless" is not a word. Please note dictionaries list it as INACCURATE or NONSTANDARD. Regardless means without regard/despite the prevailing circumstance. The prefix "ir" is negative. So if you add "ir" to a word like "without regard", it means "without without regard". That doesn’t make sense, right? So, in future, please use "regardless" instead of the inaccurate "irregardless".